Wing Mario in the original Super Mario 64. 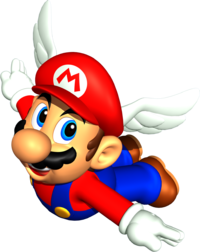 Wing Mario is the form Mario takes on whenever he grabs a Wing Cap in Super Mario 64. which grants him the ability to fly with the small wings on his cap until the time-limit expires. In order for Mario to attain flight, he must first perform a Triple Jump (which can be done in place in this form), or be shot from a Cannon. Once in the air, the player must constantly raise and lower himself to maintain flight (similar to Cape Mario in the previous game). The player can also use the wings to fall slower and prevent fall damage. Mario is also transformed into Wing Mario by grabbing the Jumbo Star that appears after defeating Bowser in the final battle. Super Mario 64 screenshot of Wing Mario. 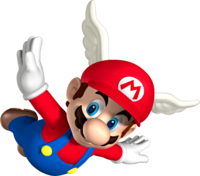 Wing Mario returns in the remake, Super Mario 64 DS, but the Wing Cap is replaced by a white feather (referred to as Wings), and it can only be obtained by Mario in the single-player game. Players can still slow their fall, but it no longer prevents damage, unlike in the original version. Also, the game's multiplayer versus mode includes yellow ! Blocks containing feathers that allow Luigi, Wario and Yoshi to use this form, though in Yoshi's case, the wings grow on his back instead. Wing Mario is also depicted on the game's Japanese and Korean Box art. Wing Mario makes a cameo appearance in one of Mario Party's title screens, where he is shown flying through the air, holding Luigi and Yoshi by their hands. It made another cameo on the side of the box of Nintendo Monopoly. The song that plays when the player is Wing Mario is a remix of the theme of Superstar Mario from Super Mario World 2: Yoshi's Island, which in turn is a remix of the original invincible tune from Super Mario Bros. This theme is shared with Vanish Mario and in the remake, Vanish Luigi. It is also used when Mario gets to ride on a green shell. The theme for Wing Mario in Super Mario 64 gets recycled for Invincible Mario's theme in New Super Mario Bros., but it has been slightly remastered, adding extra drums. Wing Mario gets referenced in Rayman Legends for the Wii U. While Rayman is wearing the Mario costume, when he glides, wings appear from the hat. This page was last edited on February 17, 2019, at 17:00.